Throughout history people have been keen to keep up with the latest trends and fashions. Whether used to display wealth or indicate membership of a certain group, clothes and bodily decoration have played an important role in human societies from our deepest past to the present day. These seven finds shine a light on our long history of sartorial innovation and the ever-present human desire to look our best. Found in 2011 at Areni 1 Cave on Armenia’s border with Iran and Turkey, this small leather shoe – complete with laces and approximately UK size 4 (US 7) – is the oldest found to date. The caves of the Vayots Dzor region are also home to a 5,900-year-old skirt, which Pavel Avetisyan of the Armenian Archaeology and Ethnography Institute, describes as being of ‘ an amazing material with rhythmic colour hues’. These rare finds were both well-preserved thanks to being buried under layers of sheep dung from the later, non-human, occupants of the caves. 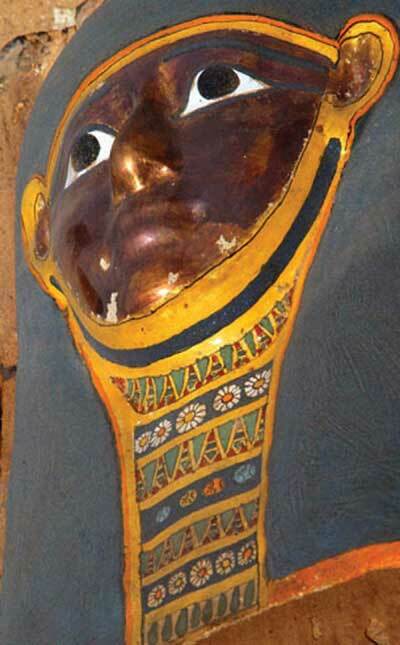 The ancient Egyptians believed that their tomb was the perfect place to ensure their status in society by displaying their wealth and influence, so it should come as no surprise that many mummies come complete with fabulous decorations and beautiful face masks to reflect the deceased’s status as a person able to afford such luxuries. Egyptian artistic conventions always portrayed people looking their best, so it comes as no surprise that many Egyptians chose to be shown in the full flush of youthful beauty in their mummy portraits, regardless of their age or appearance at the time of their death. However, this particular mummy – whose identity is unknown and who hails from Saqqara – is an especially stunning example and hit the headlines as the world’s most beautiful mummy. Dating from the time of the 30th dynasty (381-343 BC), this stunning mummy’s face was covered with a gilded mask showing a softly smiling visage with neatly defined black eyebrows above clear black eyes, outlined with typical Egyptian-style eyeliner. A painted blue wig frames the face. Although the gender of the mummy remains unknown, it is likely to be male as the mummy is shown with a vibrantly patterned painted beard. Eyeliner and cosmetics were often used by Egyptian men. Elaborate wigs, for both the head and chin, are known from ancient Egypt and mummy masks reflect the diversity and intricacy of the hairstyles worn by ancient Egyptians. Mummies of a high status, including this one, were wrapped in fine linen and amulets of precious stones, metals and fiance placed within them. Similar amulets, believed to have magical or protective powers were also worn in life. This anonymous Egyptian is proof that a passion for fashion need not end with death! The Royal Tombs of Nimrud, in Syria, were first discovered in 1989 by an expedition of the Iraqi Department of Antiquities and Heritage. 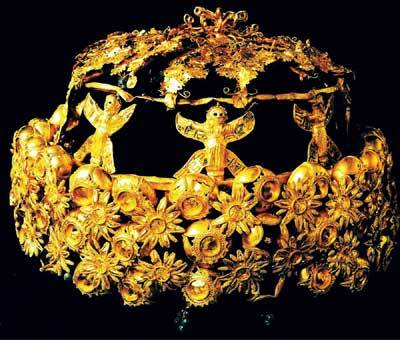 Amongst their spectacular discoveries was an assortment of jewellery and personal items including the fabulous tiara belonging to Queen Yaba, wife of King Tiglath-Pileser III, who ruled from c.744-727 BC. Found in Queen Yaba’s tomb in the north-west palace, the intricate gold tiara depicts flowers and mythical winged beasts in stunningly fine detail. The hoard, belonging to Queens Yaba, Banitu and Atalia, also included golden necklaces, bracelets, rings, hairpins and earrings as well as four bowls decorated with typical Assyrian flower motifs and inscribed with the names of the queens. 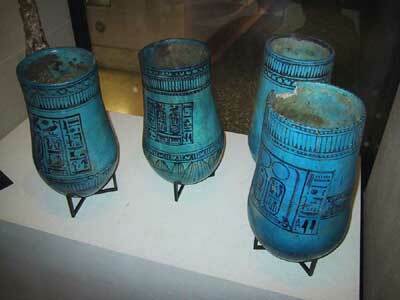 These might appear to be conventional canpoic jars, constructed of blue fiance and bearing the name of Rameses II, but they are in fact testament to the Ancient Egyptian’s love of keeping up appearances. These seemingly ordinary jars have an interesting back story behind them, they arrived in the Louvre in 1905 and seemed to contain embalmed organs including a trace of what appeared to be heart tissue. However, in keeping with the Egyptian’s belief that the heart was needed in the body to enter the afterlife, Rameses II’s Mummy was complete with his heart and the jars were dated to around 130 years after the death of Rameses II. These anomalies prompted researchers to dig deeper; Jacques Connan of the University of Strasbourg, France, doubted that these were even Canopic jars containing internal organs. He stated ‘the jars looked like the pots of unguents found in King Tutankhamun’s tomb, among others, not like other Canopic jars’ . Further analysis of the jars revealed that they originally contained cosmetics, including a scented ointment. It is thought the jars were used in rituals in a temple dedicated to Amun Ra and built by Rameses II, which would explain why his name was inscribed upon them. Cosmetic jars and containers were common throughout all periods of Egyptian history and were used to hold ointments as well as pigments, such as Galena a type of Kohl eyeliner, used to reflect the glare of the bright sun away from eyes. Cosmetic containers of all shapes, sizes and materials have been found in numerous tombs across Egypt; many still carrying traces of the pigments and ointments they once contained. It appears that humans have been draping themselves with jewellery at least 25,000 years earlier than previously thought. These shell beads date from around 100,000 to 135,000 years ago and were found at Es-Skhul, Israel, and Oued Djebbana, Algeria. 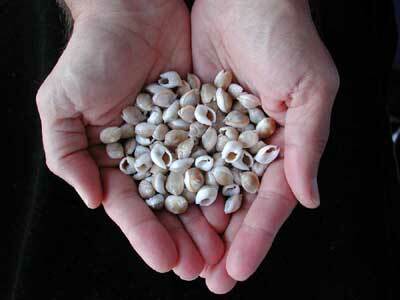 Detailed comparison to natural shell assemblages indicates that at both sites there was deliberate selection and transportation by humans of the shells, Nassarius gibbosulus seashells, for symbolic use. It is thought the beads may have been worn as jewellery, given as gifts in courtship or perhaps used to indicate tribal or group identity. The Phoenicians, a seafaring people based in what is now Lebanon between 1550-300 BC, built a vast trading empire around the Eastern Mediterranean and their most famous commodity was a vibrant, fade-resistant purple dye known as Tyrian or Phoenician purple. 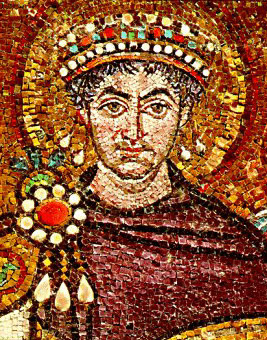 Prized by the Romans and later the Byzantines who used it for the robes of emperors such as Justinian (pictured left), it was a luxury product and immediately-recognisable status symbol – made from the mucous of a local species of shellfish decomposed in huge vats. The dye was known all around the Classical world and beyond, being mentioned by such famous names as Aristotle and Pliny the Elder as well as on Cuneiform tablets dating to 600-500 BC. 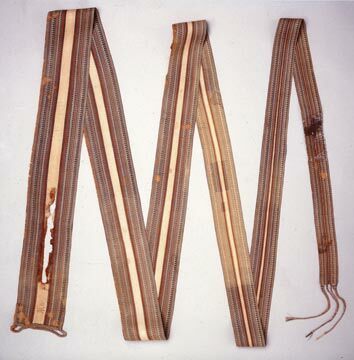 Dating from 1180 BC, this woven linen belt, owned by Rameses III, is exceptionally well preserved and vibrantly colourful for an ancient Egyptian textile. Measuring 5.2 metres long, it was probably worn in battle, wrapped several times around the waist as part of a military uniform. Colourful zig-zag design – probably taking 3-4 months to complete – would have ensured that even in the midst of battle the Pharaoh stood out in his finery. The only other surviving examples of such garments are from the tomb of Tutankhamun.